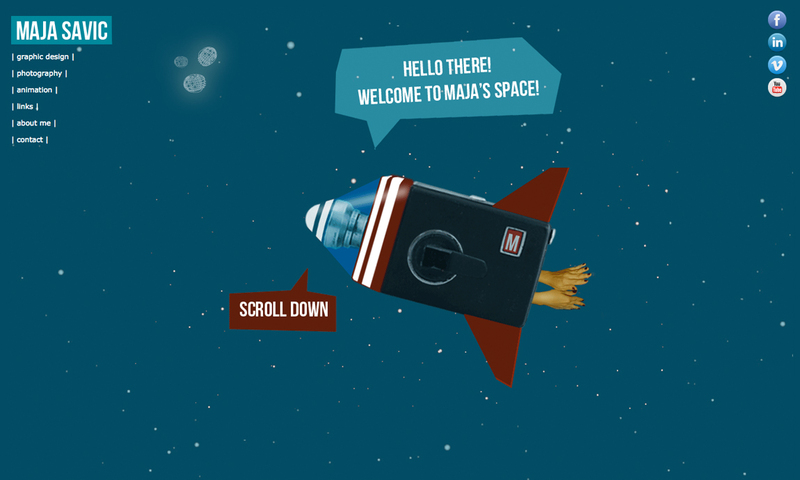 One Page portfolio for Maja Savic set in outer space. This is Maja’s first website made in dreamweaver and landed a Gold and Silver ADDY award. Personal website I designed in Dreamweaver. With no previous web design experience, I managed to put this page together and win Gold and Silver ADDY awards. The story comes from my brother who asked me a couple of years ago, why I could not find some “normal” friends, instead of hanging out with those “cosmonauts” of mine. He, who had a nine-to-five job and no interest in art, could not understand my way of life, and hence my friends and I looked like we were “lost in space” to him. Surprisingly, when I told this story to fellow artists, they loved it. Living as a cosmonaut became a mission for all of us. The entire website is designed around this concept.